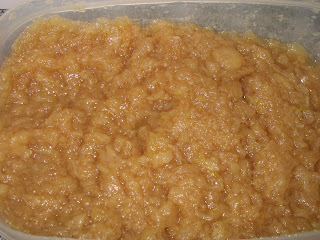 This recipe is based on my neighbor Rachel's recipe for applesauce. I also got to make use of my shiny new Hannukkah present, the classic tome, Joy of Cooking - which I surprisingly had not owned till now! I used it to get an idea of how much water to put and what other various flavorings I could put. In the end, I decided to stick with simple cinnamon-flavored applesauce. This made an excellent topping for my latkes last week. And the leftovers made an excellent midnight snack :) The best part of it all is that it's completely unsweetened - because it doesn't need any extra sugar! The particular apple types are sweet enough to not require the addition of any sugar or sweetener. 1. Put apples, water, cinnamon and cinnamon sticks in a pot. Mix well. Cook over medium heat, covered, for about 30-40 minutes or until the apples are soft and mushy. 2. Remove the cinnamon sticks and mash the apples. Ooh sugar free - my mom and dad will love this! Thanks!